The installation Farben (colors) is a subtle interplay with the phenomena of the world around us on the level of sensory experience. Its starting point is public space with its sounds and noises, its architectonic, social, functional and rhythmic structures. These are the “Farben”– the characteristics from which Sam Auinger and Hannes Strobl develop the language of their composition for concrete space. 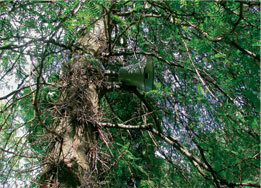 Ambient acoustic events and musical sequences recorded on site serve as the sound material. They determine the composition’s spatial form and temporal course. The strategy of the installation is to conduct a constant dialogue between reality and imagination and to facilitate open interaction between the “outer” world and the world of “inner” images and impressions. The sonic environment, which has very specific features and qualities in each place, – it might be loud or quiet, light or dark, pulsing or fading, clear or diffuse – is conceived of as an instrument. Through direct contact, capturing the location’s moods and idiosyncrasies, and precise analysis, its many variations are revealed. Farben transforms the city’s pulse, the “breath” of the place, into a poetic and musical space that foregrounds sensory perception. The “aesthetic” space that is generated, “intoned” through intuition, emotion and bodily states, becomes a natural part of the sonic ambience. As tamtam puts it, “the sound environment becomes the instrument, the instrument becomes the sound environment”. The great, apparently incommensurable contrasts of the urban metropolis – here, the constant noise of passing autos, the roar of the busy main arteries around Alexanderplatz that coexists alongside the ruins of a Franciscan monastery church, a space of contemplation and remembrance – are combined so that they can be experienced in a manner that is subjectively relevant without getting in the way of feelings of identity. The place itself is brought into relationship with the “feeling of being present”. The city, its history, architectural development, social functioning and its ensuing “pronouncements” are brought into focus as a part of ourselves. The “Farben”, the colors of our surroundings, are not just abstract signs and signals that aid in orientation, nor a system to which we would want to unconsciously submit. Colors, like the installation by Sam Auinger and Hannes Strobl, have a broad spectrum and are linked to a complex perceptual interplay, to the light that makes them appear and disappear.